Corbeau Reclining Seat - VX2000 UNIVERSAL - Dezod Motorsports Inc - Home of the automotive performance enthusiast since 2002. The revolutionary designed Corbeau VX2000 Racing Seat combines the latest technology to provide drivers of all kinds with the ultimate seat. This anatomically advanced, one of a kind seat, features state-of-the-art injection molded foam, and a custom injection molded composite shell back. Standard features include: ergonomic design, harness belt capability, integrated shoulder, kidney and thigh support, and a fully adjustable seat back with a flip forward fingertip controlled lever for rear access. 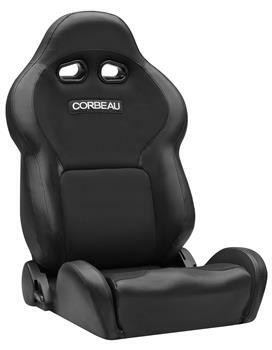 Corbeau is excited to release the VX2000 in an all-new 100% Black Leather option. The VX2000 will fit up to a 44” waist.